Customer Experience (CX) is the new competitive battleground for business. Whenever and wherever your customers interact with your brand, they have lofty expectations of a seamless experience across all channels. Whether speaking to an agent on the phone, making an online purchase or using a mobile application, they expect great service and a consistent brand experience. No channel can be ignored. Delivering a truly omnichannel Customer Experience is now a primary source of differentiation in today’s business world. Living up to your customer expectations can be a daunting endeavor but there are technology solutions to help you optimize your efforts – some of which may be already present in your very own organization. Here are four ways to optimize your omnichannel CX through today’s technology solutions. Better understanding your customers is your top priority. Business Intelligence, specifically the variety of software applications available to analyze and assess a company’s raw data, has revolutionized the way organizations understand their business and its relationship with customers. The sheer volume of customer data available today is staggering. However, don’t be misled. The mere act of collecting massive amounts of information about your customers does not translate automatically to Business Intelligence. It’s critical you understand what data is important to meeting your Key Performance Indicators, internal operational needs and organizational constraints. Effectively integrating your customer data and BI strategies will put your organization in a position to better understand, influence and predict customer behaviors. For example, not all customers offer the same amount of value to a company. The frequency and value of purchases can vary greatly. Utilizing BI can allow an organization to prioritize segments of their customer base and target their marketing efforts in a manner that will maximize overall customer value. Effective use of Business Intelligence can also enable enterprises to predict when customers make purchases allowing inventory schedules and staffing plans to be scaled more efficiently. When used methodically and integrated within your corporate infrastructure, BI is one of the most powerful tools you have for understanding your customers and their behaviors. 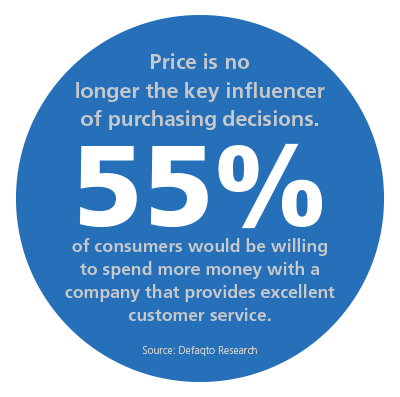 It directly impacts your bottom line and enhances Customer Experience across all channels. To consistently deliver a better experience, you need to understand the experiences you are delivering today. 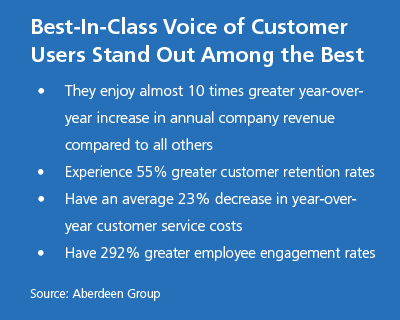 Voice of Customer is the in-depth process of capturing a customer’s expectations, preferences and opinions and analyzing each to gain new business insights. As a key component in any CX strategy, it includes all the cumulative feedback an enterprise collects through a variety of touch points during the customer journey. While all companies launch VoC programs with the very best of intentions, we often find that data is lost as it travels across multiple data collection points and stalls in departmentalized systems. In order for your customer’s to be truly heard, it’s important that your Information Technology group provide active leadership and fulfill an integrated and strategic role in your program management. By doing so, they can ensure data is integrated from multiple sources and all key performance indicators are considered in your reporting. Equipped with an enterprise-wide knowledge of systems and processes, your IT leadership lends a unique perspective that can often tap into previous unknown data streams and enhance your overall competitive advantage. As Customer Experience continues to rapidly evolve, customers are seeking more real-time, personalized and human experiences. Artificial Intelligence, when computers behave like humans, is no longer science fiction. As machines continue to get smarter, innovative and customer-centric companies are realizing how AI improves consumer engagement and enhances Customer Experience. In short, AI provides computers the means to make decisions the way a human would and its application to business and Customer Experience operations is broad ranging. Contemporary call centers utilize AI by using an incoming or outgoing phone number to generate a customer profile and then routing the caller to the best agent to handle their request based on the services or products they have previously purchased. The capabilities of Artificial Intelligence also include the ability to make recommendations to shoppers as they navigate a website or help businesses more efficiently manage inventories to stay in tune with consumer demand. Most importantly, AI evolves the user experience and collapses many apps into one seamless experience that is personal, scalable and integrated. It’s a powerful form of technology that can be utilized throughout an enterprise and deliver a more personal experience to customers in every aspect of an omnichannel CX strategy. Do you have a mobile app to interface with your customers? Do you provide instant response to your customers? Do you use mobile as a promotion platform? The influence technology plays in your Customer Experience in constantly expanding and evolving. These 4 strategies serve as a great place to start when evaluating how your organization can be more effective at leveraging technology to optimize your approach to omnichannel CX. "Delivering a dynamic and omni-channel experience is now a primary source of brand differentiation. It’s critical that companies heavily leverage technology as a source of innovation and sustainable success."